The fight against ovarian cancer requires a multi-level approach. This approach should include primary physician care training, sound medical invention, preventive and treatment behavior programs in nutrition and physical activity that are research based. In addition, funding support for this disease needs a strong national collaboration across many medical and fund raising cancer organizations. 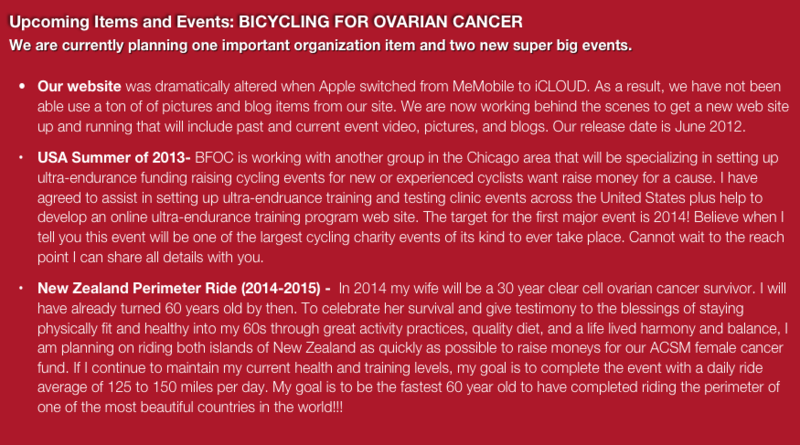 My dream to cycle the perimeter of United States (Craig) was developed out of a personal decision several years ago to utilize my 30 year love of cycling and my current career as a preventive medicine nutrition and physical activity researcher to do something special to honor my wife in her 20th year of surviving ovarian cancer. The ending date August 25, 2009, was also our 25th wedding anniversary. 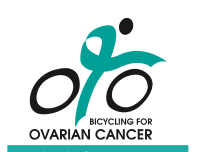 When I decided to make a personal and professional difference to celebrate my wife’s survival of ovarian cancer, I personally could not envision the challenges and end coming when I thought of all the hours and miles on the bike, mountains, winds, heat, rain, and the cold I would encounter as a 55 year old average Joe trying to go beyond his physical limits. The 12 months prior to and including the ride, according to my cycle meters, I road a bike approximately 20,000 miles. But, despite the miles and miles of riding before and during my ride, whatever I faced on this journey, it was nothing compared to what every cancer patient faces when they are diagnosed and doctors tell them about the challenges of chemo, radiation, surgery, loss of life quality, loss of jobs, family challenges, and the potential of a complete loss of life. In comparison, this ride was a cakewalk. Ok. I did not feel like that but I am sure it is compared to the battles a cancer patient must face. You are my heroes!